The United Kingdom has the world's fifth largest economy by GDP (nominal), and the second largest economy in the European Union. 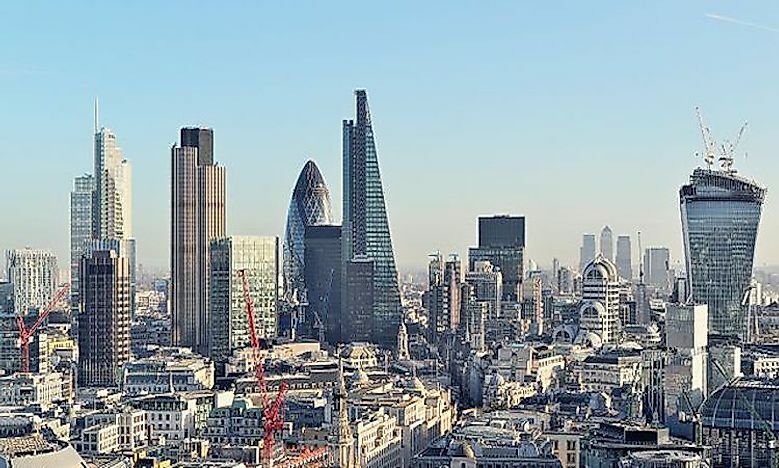 The City of London, United Kingdom is the economic capital of the country. The United Kingdom (UK) consists of England, Scotland, Wales, and Northern Ireland. This region practices a free market economy, which means that buyers and sellers have most of the decision-making power and are not restricted by government policies. The economy of the UK is the fifth largest in the world when measured by nominal gross domestic product (GDP). Additionally, it is the second largest economy in the European Union (although it has recently voted to terminate its membership). In 2015, the nominal GDP for the UK was $2.849 trillion and GDP per capita was $43,770 on average. It has a workforce of 31.75 million and an employment rate of 74.5%. Of these employed individuals, 79.7% work in the services industry, 18.8% in industry, and 1.5% in agriculture. The principal sector in the UK is services, which makes up 78% of the GDP. This is mainly driven by the financial services industry in London, the largest financial center in the world. Other important industries here include aerospace, pharmaceuticals, oil and gas production, agriculture, and construction. Its aerospace industry is ranked between the second and third largest in the world. In addition, the UK has the third largest pharmaceutical research and development industry. In 2014, the UK exported $472 billion worth of goods, making it the 9th largest export economy in the world. Its principal exports include: cars ($46 billion), gold ($37.4 billion), crude petroleum ($23.1 billion), refined petroleum ($22.1 billion), and packaged medication ($19.6 billion). A large percentage of its exports go to the following countries: the US ($51 billion), Germany ($46.5 billion), the Netherlands ($41.2 billion), Switzerland ($33.6 billion), and France ($27 billion). For 2014, the imports to the UK totaled $663 billion, giving this region a $191 billion negative trade balance. This means that the UK imports more goods than it exports. Its major imports include: cars ($47.3 billion), crude petroleum ($34.1 billion), refined petroleum ($27.7 billion), packaged medicines ($21.5 billion), and computers ($16.9 billion). A large portion of its imports come from the following countries: Germany ($100 billion), China ($62.7 billion), the Netherlands ($50.7 billion), the US ($44.4 billion), and France ($41.5 billion). Since the UK has voted to end its European Union membership, the region faces some very unique economic challenges. According to the Financial Policy Committee of the Bank of England, these challenges include consumer debt, commercial property, account deficit, insecure markets, and volatility in the global market. Consumer debt, for example, is higher than the historical average, meaning that households have a little difference between their debt and income. This high level of borrowing has been encouraged by low-interest rates. If the economy takes a downturn, however, consumers will find themselves unable to repay those debts. One of the other major challenges listed by the Bank of England was commercial properties. Over the last few years, the cost of this type of real estate has been substantially increasing. This increase is happening at the same time that rental incomes are decreasing. This is a problem because it will become increasingly difficult for business owners to use their properties a collateral for borrowing funds. To fight the previously mentioned challenges, several economists have offered advice to the UK. The biggest piece of advice is that the government needs to act quickly, taking a proactive rather than reactive stance. This action needs to involve creating alternative trade agreements with other EU members as well as international countries. Other proactive action suggestions include: reducing the corporate tax rate from 20% to 15%, increase tax credits for research and development, and increase the annual investment limit. Following these suggestions would help the region to strengthen the economy by increasing jobs and revenues.